Vegan Spanakopita or Nistisimi Spanakopita, is a Lenten version of a spinach pie, which we make during Lent without any egg or cheese. A small amount of semolina is added in the filling to bind the ingredients. I also add some ground flaxseed, which contains Omega 3- essential fatty acids, to make it much healthier. Spanakopita must be the most popular Greek street food. The most simplest form of spanakopita (spinach pie) is that made with store bought phyllo. However, in Greece you will enjoy amazing spanakopitas with homemade phyllo and the filling is the most aromatic, as we use herbs unique to Greece. 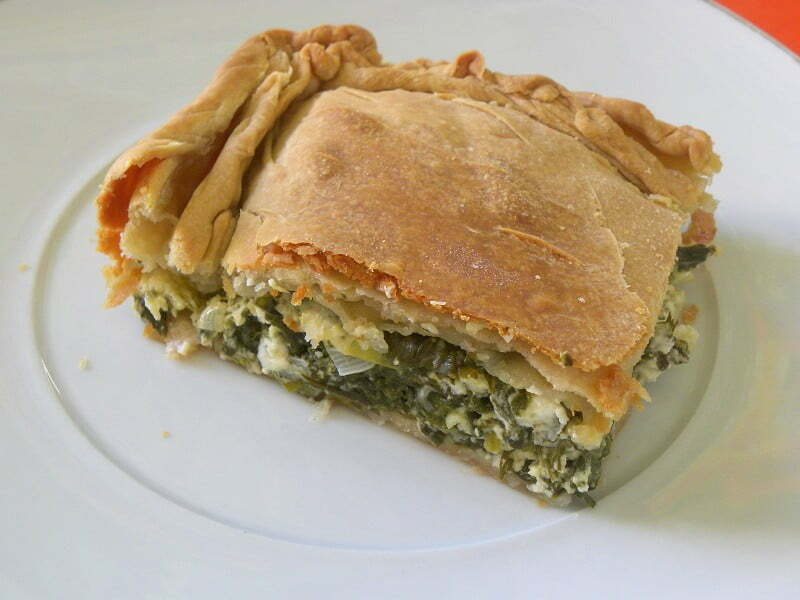 As with tyropita (cheese pie), there are many types of spanakopita in Greece, as well as a combination of both called Spanakotyropita, or when there is less spinach (or none at all) and more greens, it is called hortopita. These kind of foods are staples in Greek cooking so every now and then I make a spanakopita or a tyropita and each time I make one, I rarely follow the same recipe twice as the variety of greens and herbs is so wide that each time, depending on what I buy at the farmers’ market, I make a new kind. The whole philosophy behind Greek pittes was to make good use of vegetables and ingredients they had at home. People living in the countryside, usually had a few chickens in their back yard, so they always had eggs and most of them had a few goats or sheep to get milk and make their own dairy products and a garden to grow vegetables. The other important factor to make a spanakopita different is the phyllo. There is nothing like homemade phyllo, without of course wanting to say that store bought phyllo is not good. When I used to work and did not have time to make phyllo from scratch, I used to make it with phyllo croustas, that is the same phyllo we use to make baklavas, or with puff pastry. Now that I am at home and have a lot of time I rarely make it with store bought phyllo. However, during Lent when I was planning to make a Vegan Spanakopita (that is the Lenten version without cheese and eggs) when I woke up in the morning I had a terrible backache and of course making phyllo from scratch was out of the question. As I had already bought all the other ingredients from the farmers’ market the previous day and all the herbs were already washed and ready to be used, I made the spanakopita with a store bought phyllo using the type called “horiatiko” village type, which is ideal for pies. This phyllo is quite thick so there are only 6 sheets in each packet, so I used three below and three above the filling, each phyllo generously brushed with olive oil. As spanakopita owes a lot of its taste to the cheese and eggs, making a pie with only spinach and a couple of aromatic herbs would still make a good spanakopita but in order to get the wow factor and make it really tasty, you need a lot of herbs and a variety of greens. The variety of cheeses in regular spanakopitas may also be different and I’ve made spanakopita and tyropita using feta, xynomyzithra, anthotyro, graviera, even halloumi. The last cheese I have used is Katiki Domokou and any Greek cheese used is absolutely delicious. This vegan pie is very healthy as all the greens especially the wild greens are a great source of nutrients. Pies are dominating in the Mediterranean Diet as they contain vitamins, antioxidants, flavonoids and fibre. Combined with whole wheat and olive oil in the dough a piece of pie is a very nutritious snack. Two of my favourite herbs I use when making Spanakopita are Kafkalithres (Mediterranean Hartwort) and Myronia (chervil) which are very aromatic and give a wonderful taste to the pie. If these herbs are not be available in your country, improvise with any aromatic herbs you can get in your country. The variety of herbs and greens are up to you and depending on what you like best. Wash the spinach, removing the stems or any damaged leaves and drain. Frozen spinach reduces the time of preparation considerably but defrost before using. Sprinkle with salt and after half an hour squeeze it with your hands to remove all liquid. Do the same thing with the chard. Alternatively, when still wet you can put them in a big saucepan, without any additional water, and bring to a soft boil for about 5 minutes, until it wilts. It will become soft and its volume will be reduced. Place it in a colander to cool and when it can be handled, drain any water by squeezing it and then cut it into smaller pieces. Place the spinach in a large bowl and add the olive oil, the onions and herbs, semolina and spices and mix well. Grease a 35 x 30 cm (14 x 12”) or 30 cm – 12”diametre baking tin (preferably a shallow one) with olive oil. The remaining olive oil will be used to brush the phyllo. Brush each phyllo with olive oil placing it on your baking tin with part of phyllo overhanging on all sides. Continue with half of the phyllo sheets, brushing them again with olive oil. Fold the overhanging phyllos on top of the filling, lightly brushing them with olive oil. Cut the remaining phyllos the exact size of your baking tin and continue adding them on top, oiling each phyllo. With a very sharp knife, cut through the top layers of phyllo and the spinach, taking care to not cut the bottom layers of phyllo, into diamonds or squares. Preheat oven to 180o C / 350ο F and bake for about 45 minutes or until the top is crisp and golden. Remove from the oven and let cool for a few minutes before cutting all the way through to the bottom. Ever since I made this Lenten spanakopita, I have made it a few more many times again using leeks and fennel, as they add a fantastic taste. The last time I made it again was yesterday but this time I decided to try a whole wheat phyllo. So if you want a healthier version of spanakopita I can assure you that It tasted just as good and it makes a very nutritious snack. If you find it intimidating to make your own phyllo using a dowel, make it on a pasta maker which makes it really easy to make and you will see how delicious the phyllo tastes! This time I made it “strifti”, which means twisted. The phyllo is rolled out into a large sheet the filling is added on one side then rolled and the ends are twisted into the opposite direction. The roll is either made into a coil or placed in a baking tin one next to the other. See step-by-step instructions how to make dough and phyllo here. Substitute all-purpose flour with whole-wheat flour. Wash spinach and while it is still wet place it in a pot and bring to a boil for a few minutes until it wilts. Drain and remove excess water. In a large skillet heat the olive oil and sauté the leeks, then add the spring onions and sauté until translucent. Add spinach and mix. Remove from the heat and allow to cool. Crumble feta and add to the mixture as well as katiki and mix in the eggs. Brush baking tin with olive oil and preheat oven to 180 degrees C (350F). Roll out phyllo into a 25 x 25 cm sheet and place a generous amount of filling on one side. Make a roll and press each side to seal in the filling. Then twist both ends towards opposite direction pulling and stretching it to the size of your tin. Place each roll in the tin and continue the same procedure with the remaining mixture. Brush phyllo with olive oil and bake for about 45 minutes or until golden brown. This is not over. I still have another recipe which needs to be mentioned: A ‘Spanakopita” Omelette. The previous time I made spanakopita I had some leftover vegan filling and since a member of the family was not fasting, in h evening I made it into an omelette. I did not take any pictures since I do not have good lighting. However if you have filling with cheese in it, you can still make it without adding additional cheese. This was THE best omelette I ever ate! This is not an omelette you can do every day because of the many ingredients it has in it but when you make spanakopita, keep some filling and make this omelette and you won’t regret it. This time, I kept some filling on purpose to recreate the omelette again. After heating the olive oil in a non-stick frying pan (24 cm), sauté the mixture for five minutes, mixing continuously. Beat the eggs and add the pepper. Then pour it on top of the spinach mixture. Crumble some feta on top. When it sets, remove it to a plate and then invert it in the frying pan again and cook until the eggs set. My Lenten recipe of Spanakopita goes to Sweatha, of Experiments, Emotions, Experiences with Food, for her event Food in Colours, created by Harini, of Tongue Ticklers. The colour I have chosen is GREEN. Oh! I do like the healthy wholemeal version Ivy! Personally, I prefer the spanakopita without cheese so a nice healthy version is so perfect! Bravo..a really educational and informative post. I love this. In Turkish restaurants or snack shops here, one can also find something similar ….whole wheat filo pastry is for sure worth a try! Gotta google now to find out what the following items are…….. I never realized that phyllo was something that could be made at home. But I like the ease of using readymade phyllo sheets like you did in this spanakopita. Whole Wheat phyllo??? No way!!! That’s a must try for next time! And I love they way you wrapped them, we usually make them in a pan like the lenten version, or we wrap individual ones (soooo long of a process), but I love the long wraps. I’m gonna have to try it that way next time! I don’t think anything is more universally eaten and loved by Greeks than tyropita and spanakopita. A snack, a meal, a side dish…all delicious. This looks so good Ivy, and I am sure it is a cure for anything that might be ailing you! Have a great weekend! Lovely versions of spanakopita Ivy. The leeks and fennel are definitely a great addition and take the normal spanakopita to another level. Kalo Savvato-Kyriako! How r u doing?Howz the book coming along. I am finally back to blogging after a long break. This sounds like a delicious version of spanakopita! The greens and the fennel sound great. I’m not very familiar with Greek cheeses, but I’d love to learn by tasting. One of these days I must try making this favoured dish. The vegan version is especially intriguing. All those greens and herbs sound wonderful paired together. Fabulous! This looks easy & healthy & delicious. Would make wonderful snack bites for a party too. I might try this out soon. I really enjoyed reading about the Lenten spanakopita. Made with whole wheat phyllo, it sounds so healthy and tasty too. The natural foods section of my local grocery store carries a whole wheat frozen version of phyllo. I’ve never attempted homemade phyllo. My grandmother used to make it, paper thin. And being the silly child that I was, I thought it was hilarious to poke a whole in it. Now I know better. Thanks for the sweet message Ivy! So, I have a graduation party last weekend… and guess what app we have? Spanakopita! Cool, right? This looks delicious Ivy. I am glad to see that you gave instructions for using ready made phyllo, because I am not ready to climb that mountain yet! I love spanakopita! This looks so delicious! I’ve never made it at home but I would really like to try. Thanks for sharing the recipe! Never seen so many greens together in a single dish! The combination of the greens is new to me. In Indian recipes dill is used by itself or in combination with bengal gram but never with other greens, so I am really intrigued by your recipe. Looks so delicious too! I love your method of filling the dough with the greens then twisting it. Genius! I just made your recipe last night for dinner Ivy. I had to modify it somewhat since I didn’t have all the herbs. But even thou it turned out soooooo delicious. 10thumbs up from my family. I liked spanakopita before, after making your way it’s just a whole other even better dish. I will try the Spanakopita tomorrow. Hope it works out. I will keep you posted. Have bookmarked this recipe. So want to make it. All the items looks so spicy . i think there is a lot of things to learn from this blog. I used three below and three above the filling, each phyllo generously brushed with olive oil. ..